Masked attackers have destroyed a new Maidan protest tent camp in central Kiev. It was set up to demand that Ukrainian President Petro Poroshenko delivers on his pre-election promises. Late on Sunday evening, around 50 to 100 men wearing balaclavas rampaged through the camp. They tore down tents and sent the protesters scattering. The camp was set up by roughly 100 demonstrators, who said they would be staying put until the current government and President Poroshenko produce a report on what they have managed to achieve since they have been in power. The protesters also demanded that the government fulfil the promises it had previously made. Placards at the protest read: “Out with [Prime Minister Arseny] Yatsenyuk and his reforms” and “I’m on hunger strike against administrative neglect.” Tents were also adorned with flags, including at least one from the ultranationalist Right Sector movement, which is vocally unhappy with President Poroshenko’s rule. 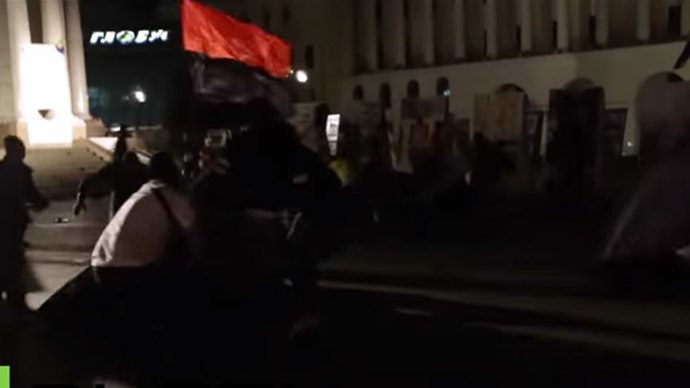 The flag was torn down by masked men together with one of tents in the video above. Protesters say police were stationed right next to the site - but did nothing to prevent the attack. “They took me and dragged me like I was in a sleigh. I screamed, thinking they would beat me up, but they quickly dispersed. It looked like a theater production because the police were nearby and did nothing,” one of the demonstrators told the Ruptly video news agency. Police, however, denied making any arrests, RIA Novosti reported. “The police are looking into the incident. No one was detained, no criminal case has been opened so far,” the agency said, citing the police press secretary Yulia Mustash. No information on the incident is available from Ukraine’s Interior Ministry website either. This somewhat contradicts what the head of Ukraine’s security service SBU told the Ukrainian media on Monday. He said the organizer of the Maidan 3 protest had been expelled from the country. The participants of the tent camp protest in Kiev at Independence Square (Maidan) dubbed their movement Maidan 3.0, after the two uprisings that also began at the site. Activist tent sites played a major role in the Maidan protests over a year ago, which led to an armed coup in Ukraine in February 2014. Those protests started in 2013 as a peaceful campaign against then-President Viktor Yanukovich’s intention to put on hold a EU association deal. Following the coup, the new authorities promised to undertake political and social reforms needed, in order to meet EU economic and democratic norms, so that Ukraine could join the union as soon as possible. However, progress seems to have stalled, with Poroshenko acknowledging that he is not satisfied with his achievements after one year in office. “Whether I’m satisfied with the work of the government? I’m not. Neither with my work, nor the work of Parliament. But most importantly – the people are not happy with all of us,” he said speaking to lawmakers during his annual address to Parliament in Kiev on Thursday, according to The Kiev Post. Sunday’s camp event was preceded by a massive anti-government march held on Saturday in Kiev. Around 3,000 people participated in the rally, calling for the current government’s resignation and economic reforms.